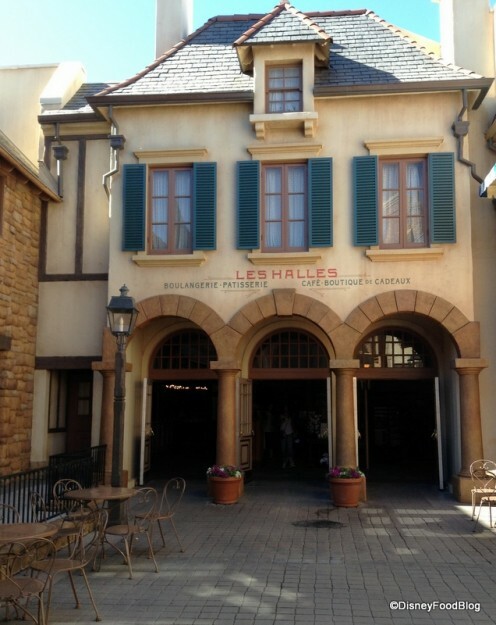 You’ll never hear us deny it: we’re fans of just about every treat that comes out of Epcot’s France Pavilion. As it turns out, so are lots of other people! 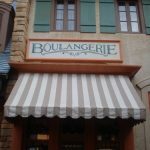 So much so, in fact, that the well-loved Boulangerie Patisserie outgrew it’s original small space and reopened in early 2013 to better accommodate more guests… and more treats! (The original space, by the way, is now home to L’Artisan des Glaces.) Additionally, a large indoor seating area was added even while the charming outdoor seating remained. When the Patisserie reopened in it’s new space as Les Halles Boulangerie Patisserie, we were so excited to see (and even more thrilled to taste) all the goodness this spot had to offer. 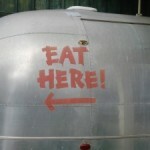 By and large, reactions to the offerings – from sweet to savory – were positive. Many favorites from the old Patisserie made it over to the new, and the expanded options were varied, impressive, and flavorful. One alteration, however, that displeased some guests was a change to a much-loved pastry: the Napoleon. 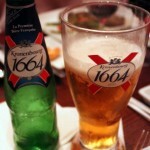 It had been updated with the reopening to provide a more authentic French culinary experience. Upon learning that people were unhappy with the change, the chefs in the France Pavilion recently made an update…to the update 🙂 ! lovely blend of the new and old versions. The filling – you may be able to tell from the photo above — is much closer to its original light cream consistency, as opposed to the more dense form it took upon the reopening (which was more like cheesecake). The replacement of glazed sugar fondant over the original powdered sugar remains with this new update, in keeping with the vision for a more traditional French Napoleon. I MUCH prefer the fondant over the previous powdered sugar version. Overall, though, I think this updated Napoleon offers the best of both worlds, and am impressed that the chefs behind all the terrific creations in Epcot’s France listened and responded to what guests had to say. So, if you tried the Napoleon upon the reopening of Les Halles, you may want to return to taste it again and find out for yourself how it’s different. We’d love to hear what you think! Also, let the France pavilion know your thoughts at @ArtisandesGlaces on twitter! Are you interested in trying the updated Napoleon? Please let us know your thoughts with a comment! 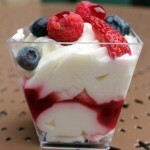 « Disney Dining Tips: The Disney World Restaurant Search Tool! Am happy to say that we will be testing the new old Napolean tomorrow after dinner at Chefs de France…..will report back. It is nice when they listen. Wish I had one right now. AJ – We need a, “Napoleon Throwdown” between this one and the one from Starring Rolls in DHS. The Napoleon from Starring Rolls is the very picture of magnificence! Bring back the Cake of the Day!!! My daughter ate that every time we were in Epcot…..and we live right next to Disney. That was her *thing*. She’s so sad now! While I know they needed more space, I miss the old patisserie. It was like being at a small village bakery in France. The new space has no “charm” at all. When we tried the new Napolean, to our dislike, we decided to not go back. We didn’t like the new location or the new Napolean. 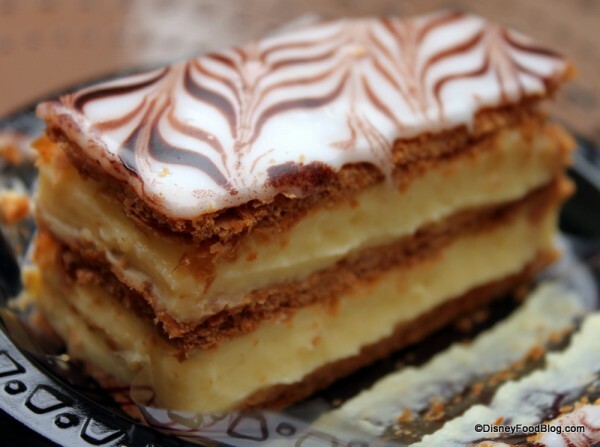 Well, have to say I’ll be in Epcot this weekend and will give the Napolean another try now that they’ve changed it. 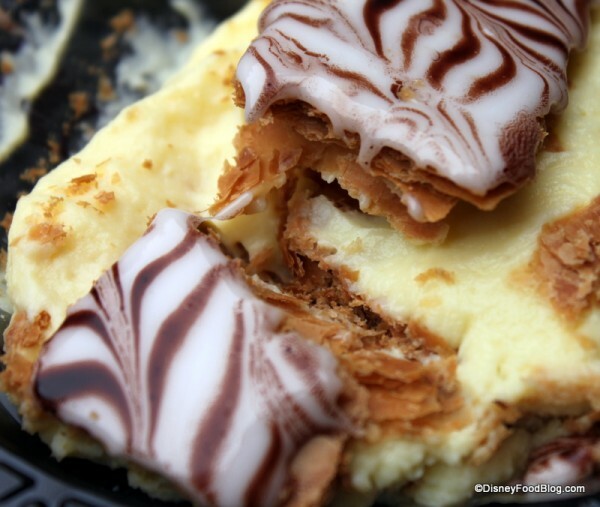 When I go to EPCOT, I always get the original Napoleon. It was so delicious. I was very disappointed in November when I tried the new version, and decided I would have to find out a new favorite. Now that they made this change, I will probably have to try it to see if it is any better. I will be there in 4 weeks, so can’t wait to try it! I was so very disappointed in the original update. I ran all the way from the Land where I left my family to the pastry shop for our napoleons. It was not worth the haul. At all. We didn’t even eat more than a couple bites of the 3 I had purchased. I would love to try the Napolean, but I can’t keep away from the lemon tart. Their lemon tarts are so good. Maybe next time. Tried it once in 2010 and it was very dry. Hope this update helped it be less dry. I was going to say the same thing Jeff said. The Napolean at Starring Rolls is a must have every trip – delicious! I used to love the creme brûlée but when I tasted it at the new place it tasted nothing like before. It went right on the garbage. Hope they change it back to original as well. This looks heavenly. Will definitely be giving it a try (if I can get passed the eclairs- my old standby). My biggest complaint has to do with the cheese plate. It’s gotten very skimpy for the price. I remember a time when you actually got cheese on the plate along with some fresh fruit and a baguette. I’m excited to hear this! The old Napolean and the DHS napolean were different, but both great. The new Napolean added the glaze of the DHS one, but otherwise was pretty lousy. I’m glad they have a new-new one that is closer to the original. This was one of my FAVORITE places to stop on every Disney trip! It was a MUST!! The GREAT DISNEY bakers must help out my fellow gluten free followers. It is not fair for us to see such beautiful desserts, that we can not eat. I do appreciate that they do offer tasty gluten free alternatives throughout WDW, but it is mostly pre-packaged. I do remember the original Napolean and it was Delicious !! My husband’s favorite! I love the new Patisserie. It is very authentic to the ones in France that I have visited. The Napoleon is my favorite but it is a little messy to eat. It is very difficult to cut throuht it without all the cream filling coming out the sides. But again that’s the way it is and it does not change the taste. If you haven’t tried it, you should….. Delicious!!!! I can tell you I have had both.The original was 10x better.Better tasting and much Larger.It used to be a must stop destination at Epcot,now I pass by. 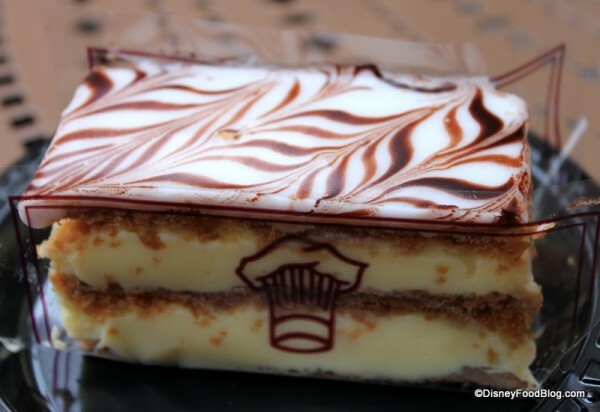 Since my first visit in 2011, I’ve raves about the Napoleon. I’ve recommended it and have been eager to get back for another. My recent visit was so disappointing. He new version tastes like the frozen desserts from Chinese restaurants. Truly awful. So disappointing. 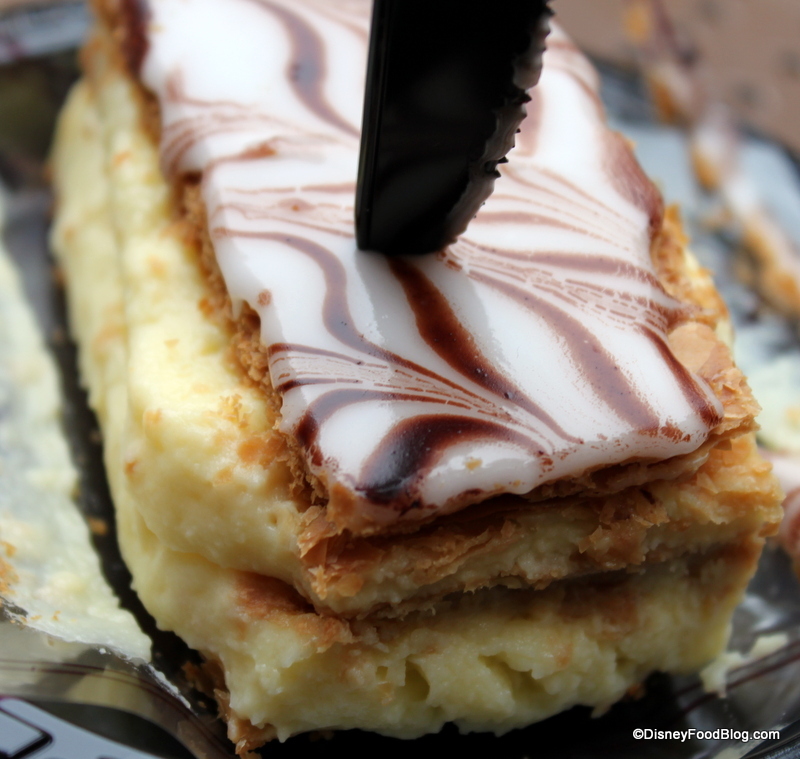 Napoleon is our absolute favorite when visiting epcot! Question. ..can I buy them online and have them shipped? ?